My adventures in the tiny village of Biniaraix a few days ago would never have been complete if I had not reached for my sketchbook and captured the little hamlet in all of its beauty. 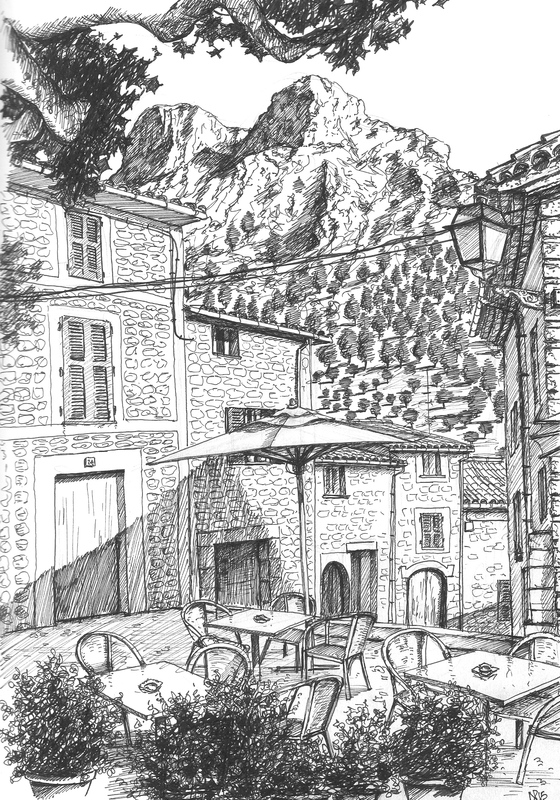 With such picturesque scenes extending from street to street, it was difficult to choose one which could aptly capture the essence of this village in sketchbook size. However, it was upon having a much needed iced coffee in the single old little cafe outside the tiny central church that I settled upon my image – of the sleepy shady terrace of the main square, looking down one of Biniaraix’s few side streets and across to the incredible mountain ranges which make the village so utterly stunning from every angle.